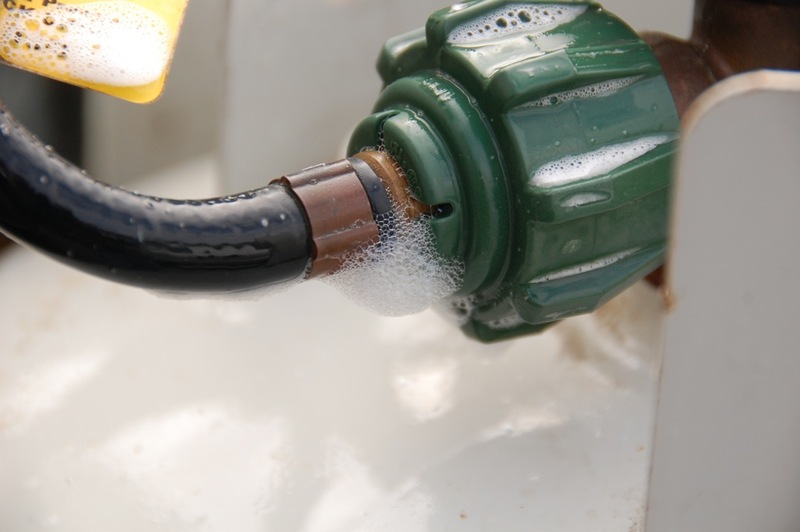 The leak was revealed by profuse bubbling at the QCC ACME Type 1 (green) fitting that connects the hose to the tank. Since our OEM hoses were eight years old, I decided to replace them both. The trick was to find the correct replacement hoses. Our OEM hoses were Model A4 made by Marshall Gas Controls in 2006. 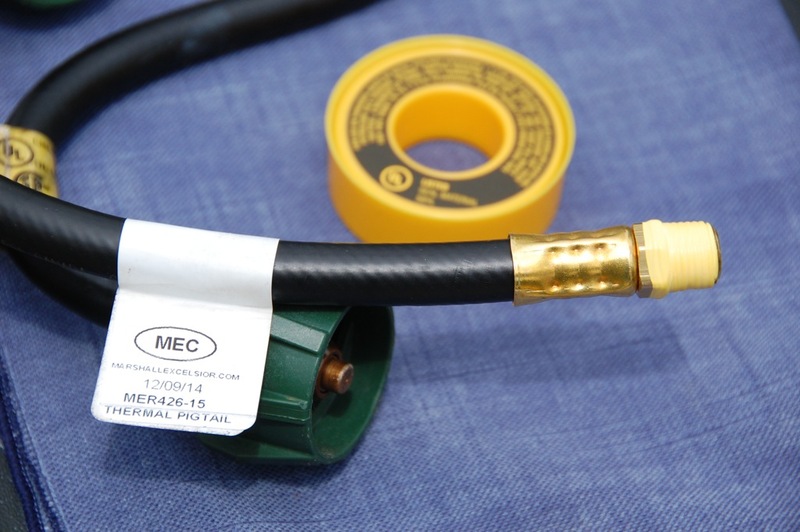 Propane pigtail hoses are available in different sizes and with different fittings at the regulator end, such as male inverted flare and male pipe thread fittings (See The RV Doctor article, “Propane Pigtails Needed.”) Our OEM regulator (Marshall Automatic Regulator, Model 250) accepts a 1/4 inch MNPT (Male National Pipe Thread) fitting. I found that the easiest and best way to find my correct replacement pigtail hose (and not have to buy an adapter) was to take my OEM hose to our local RV supply store, San Diego Trailer Supply, which assured me they would have the right hose or make me one! They matched my OEM pigtail with one off the shelf, a Marshall Excelsior MER426-15, a 15″ pigtail with 1/4″ MNPT fitting. My OEM hoses were 12″ long, but some believe the 15″ hose would be subject to less stress (See “It’s as easy as bungee jumping.”) The hose on the left in the photo below is the OEM hose. 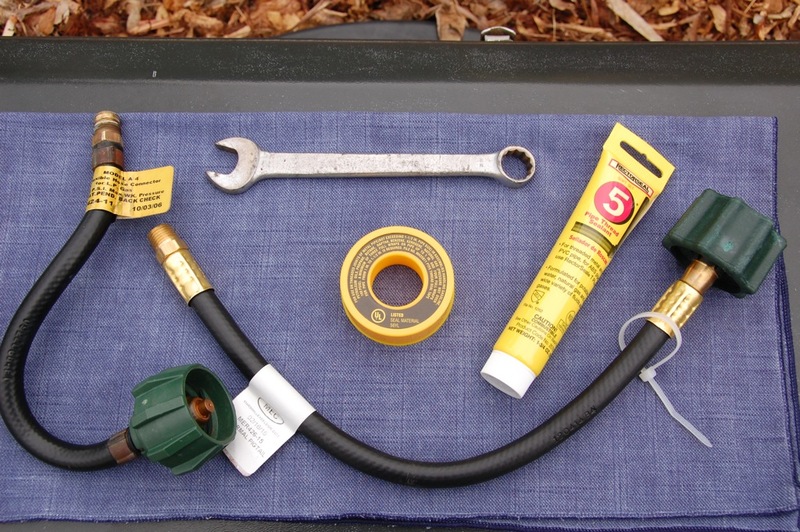 I gathered my tools, which included a 9/16″ wrench (an adjustable wrench would also work just fine) and PTFE thread seal tape (yellow coded for gas line). (I did not use the pipe thread sealant seen in the photo above.) I then wrapped the 1/4″ male pipe threads with 4 full wraps of the seal tape, wrapping clockwise. 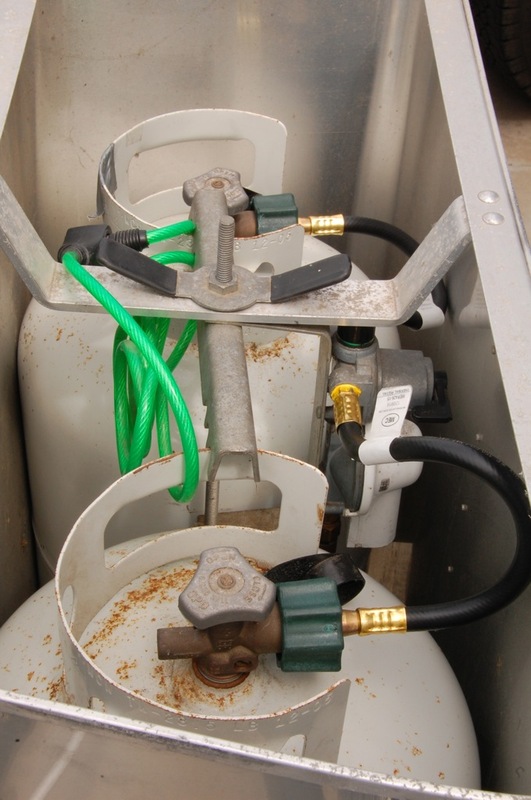 The new pigtails were then attached to the tanks and regulator. 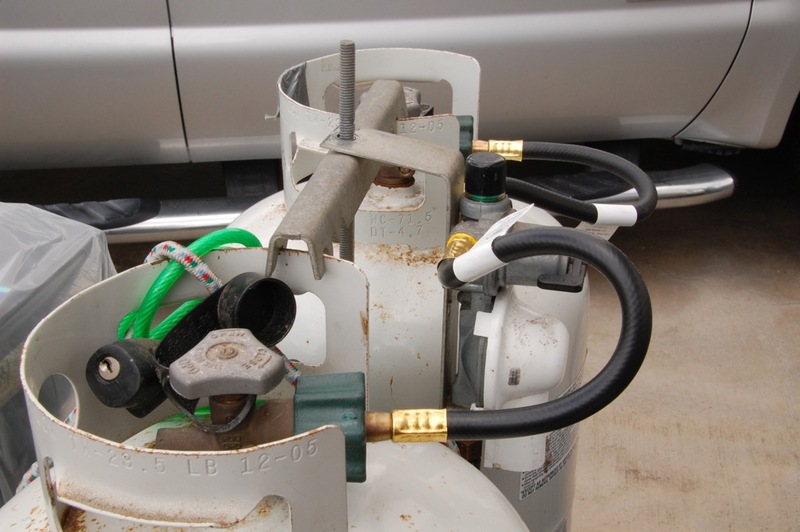 The job was finished by placing and securing the propane tank cover. A green cable lock was applied to slow down would-be thieves! This job was done by using just three tools: soapy water sprayer, wrench, and seal tape. 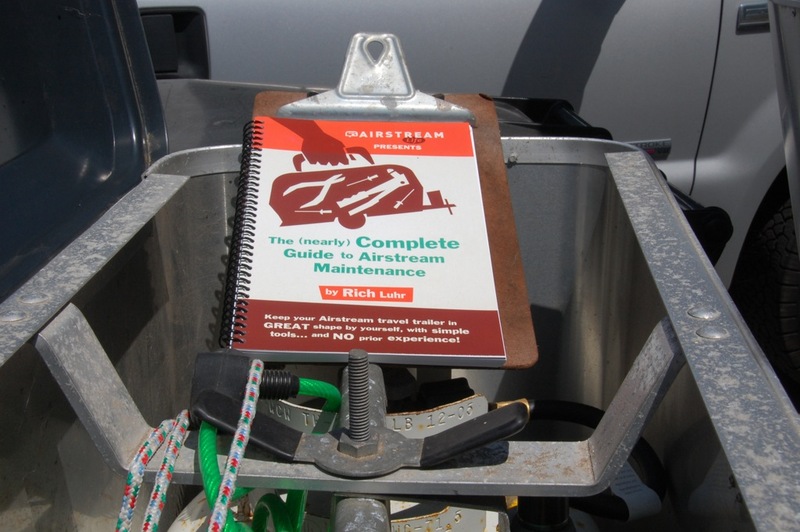 This job is one of many routine tasks covered in the hot-off-the press new book, Airstream Life’s (Nearly) Complete Guide To Airstream Maintenance, by Rich Luhr, Editor of Airstream Life magazine. Rich says, “You can keep your Airstream investment in excellent running condition for the rest of your life with just a little knowledge and a few tools. Most Airstream maintenance is simply a matter of inspecting, cleaning, lubricating, and easy adjustments — and this book will teach you how to do all of those things.” In writing this book, Rich says, “I wanted to defuse the myths, clarify the facts, and point people to easy and correct options.” This spiral-bound book has 219 pages packed with information, is well illustrated and the perfect size to keep in our Airstream, along with our traveling toolkit. 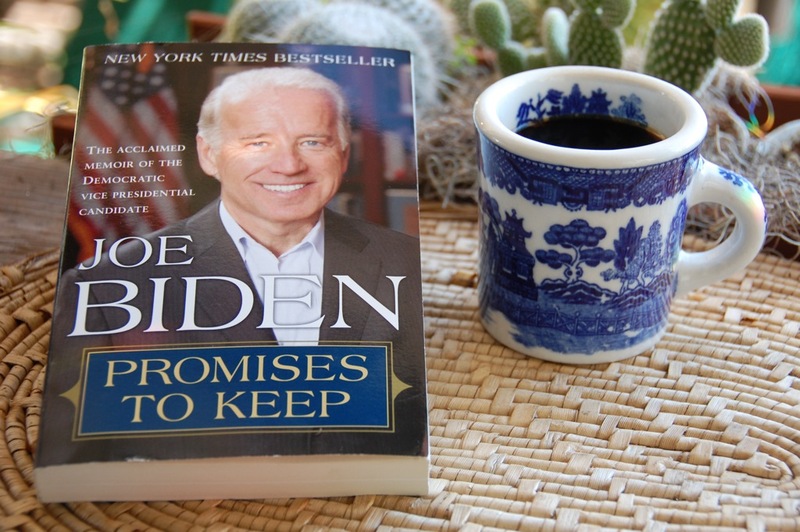 Now that I have my current Airstream maintenance in hand, I can go back to my ongoing summer reading, Promises To Keep: On Life and Politics, by Joe Biden. ** Additional information about this riveting and moving book is seen in my latest post, “End of summer flowers, fruit, and promises,” History Safari Expresso. **This is a link to a CBS NEWS video.